Wello Eixample Apartments is centrally located in Barcelona, within 10 minutes’ walk of Passeig de Gràcia and Plaza Catalunya. The modern, air-conditioned apartments offer free WiFi. 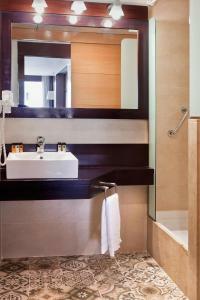 The stylish apartments have wooden floors, a balcony and private bathroom with hairdryer and toiletries. The living room has a sofa bed and flat-screen satellite TV. There is a dining area, dishwasher and washing machine. The kitchenette includes a fridge, microwave and coffee maker. You can walk to MACBA Modern Art Museum in 10 minutes from Wello Eixample Apartments. Airport buses leave from Plaza Catalunya. 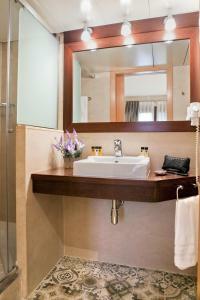 Stylish apartments have wooden floors, a balcony and private bathroom with hairdryer and toiletries. The living room has a sofa bed and flat-screen satellite TV. There is a dining area, dishwasher and washing machine. The kitchenette includes a fridge, microwave and coffee maker. This is a non-smoking apartment. Smoking is allowed on the balcony only. Please note that a free baby cot for a child up to 3 years old, is available on prior request. 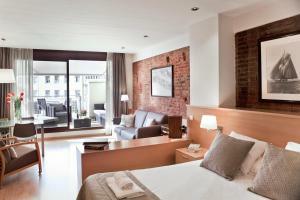 Rate: € 107.80 ... € 649.00; select dates below to get current rates. 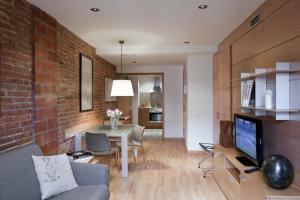 This stylish attic apartment is located in the Eixample district, close to Gaudi's Pedrera and Plaza Catalunya Square. 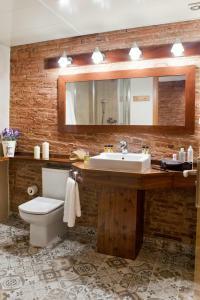 It has wooden floors, a balcony and private bathroom with hairdryer and toiletries. The living room has a sofa bed and flat-screen satellite TV. There is a dining area, dishwasher and washing machine. The kitchenette includes a fridge, microwave and coffee maker. This is a non-smoking apartment. Smoking is allowed on the balcony only. Please note that a free baby cot for a child up to 3 years old, is available on prior request.